Quick overview: How to search with Google using time specific variables. Great for tracking down information on past news stories and major world events. How can these tools be used in the classroom? Google Timeline is a tool from Google that returns search results represented on a visual timeline with units representing years or months. This technique can be useful when your students would like to explore similar topics and themes that have occurred in the past. How does the timeline search work? 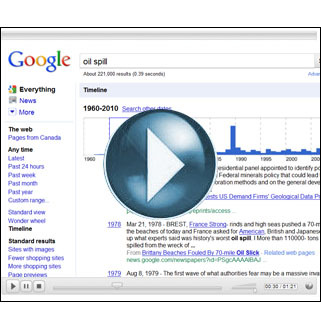 For example, typing in “oil spill” would likely show two significant peaks (of search results) on a Google Timeline graph from 1960 to 2010. The first peak would likely be in 1989 with the Exxon Valdez oil spill while the second peak would likely be in 2010 with the Deepwater Horizon distaster. This entry was posted in Tools and Apps and tagged date, google, search, Tammy Wocester, time line, timeline. Bookmark the permalink.